The IntlUni Academic Network comprises of 38 educational institutions in 27 countries. The partner representatives cover a wide range of functions within the institutions they represent – language and content lecturers and researchers, directors of international centres, directors of language centres, educational developers, etc. This heterogeneity allows the project to cover many aspects related to the internationalisation of higher education. One person from each institution participates in IntlUni meetings twice a year. At each partner institution members of a Working Group cooperate on IntlUni tasks. 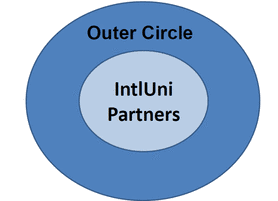 In addition to the IntlUni partners, we invite other interested parties – individual experts working in fields relevant for the content and outcomes of the IntlUni Network – to join our Outer Circle. Who may wish to interact electronically via e.g. online questionnaires, blogs, etc.